Discussion in 'Breaking and Major News about Scientology' started by CommunicatorIC, Apr 25, 2018. 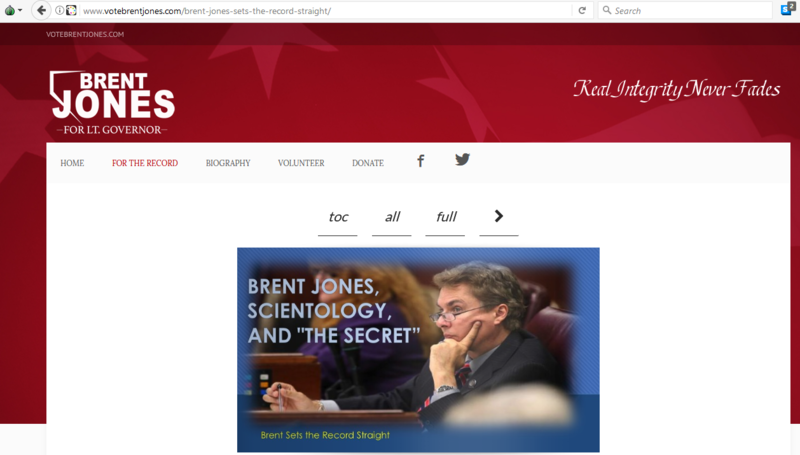 Candidate for Lieutenant Governor of Nevada Brent Jones defends Scientology and L. Ron Hubbard. Scientologist pair running for office double down on their denials about church involvement. Separate thread created because Brent Jones's name should be in the thread title for the purpose of Google indexing, as well as other reasons. 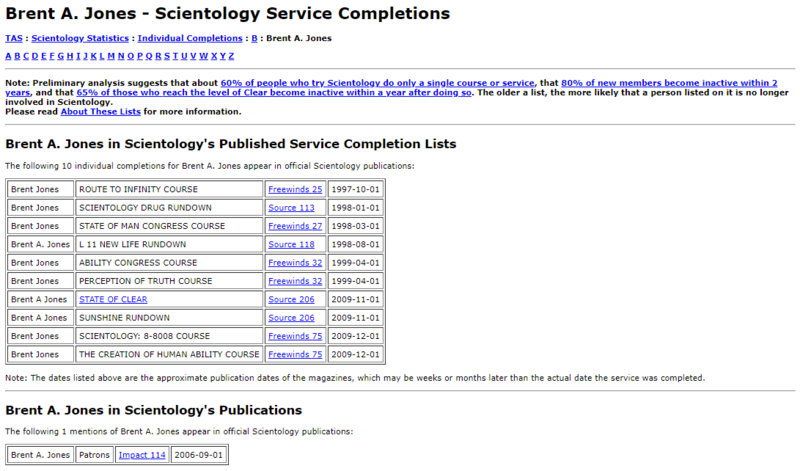 Brent A. Jones Scientology Service Completions. 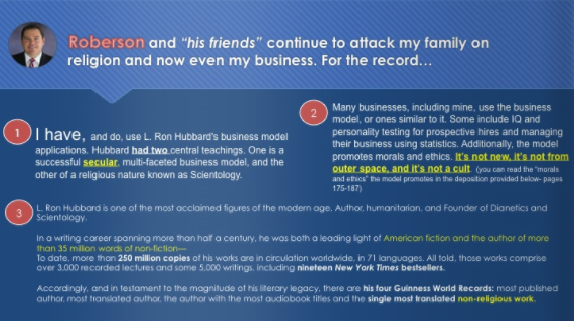 NOTE: In his slide show "Brent Jones, Scientology and "The Secret" screenshot above, Mr. Jones appears to imply that he uses only the purportedly "secular" and "business" applications of Scientology. Any such implication would be misleading and, indeed, false. Mr. Jones achieved the religious State of Clear in the Church of Scientology, and completed the Scientology religious rundown known as L 11 -- New Life Rundown. In addition, he is a Patron is the Church of Scientology. Jones pushed back against a lawsuit filed by a former employee during the heat of his 2016 primary campaign. The woman accused Jones’ business of making her watch Scientology videos. He pulled out a deposition from the woman in which she said she never spoke to Jones about Scientology. The lawsuit is still pending. “You have religious freedom in our company,” he said. “The video she was talking about, that she actually put in the pleadings, was The Secret. “The Secret has nothing to do with Scientology. He waved the deposition around making claims...using it as a prop..
hasn't entered the trial stages yet.. I thought "public disavowal of scientology" was a Suppressive Act? I believe if you read his slide show / flip book carefully, he does not actually disavow Scientology. He appears to imply that he has done only the purportedly "secular" and "business" aspects," but doesn't really say that, and doesn't disavow Scientology at all. Earlier, his campaign spokeswoman did, but he backed off from that. I'm sure he would say his campaign spokeswoman misspoke, or was misinformed. Curious to know the difference between secular LRH management tech and non-secular management tech on the subject of using an “acceptable truth” vs the actual truth? Even though I know the policies, reporter TRs and drills on lying (TR-L), it is nonetheless shocking to see it in black and white, in Hubbard's own words every time I read his sacred "scripture" authorizing, even mandating, his cult members to lie. --- Muslim "Taqiya" practice of lying to avoid "for religious purposes" and to avoid religious "persecution". These examples and others are perfectly and synchronously aligned to the cult of Scientology's "Greatest Good" doctrine. The mastery of lying is not just a necessity for a lying cult, it is a virtue. To wit, the very best liar in the entire worldwide cult gets to live the life-style of a billionaire at the expense of the rest of the clueless cult members. If two contending expert liars are vying for the post of supreme rulah, the one that is awarded the lifetime position is the one that is willing to use the greater amount of sociopathic violence to enforce the lies. Well, if his water selling business used Cult Administrative “technology”.... and his employees have to use said methods....then he is making his employees learn and use Scientology. 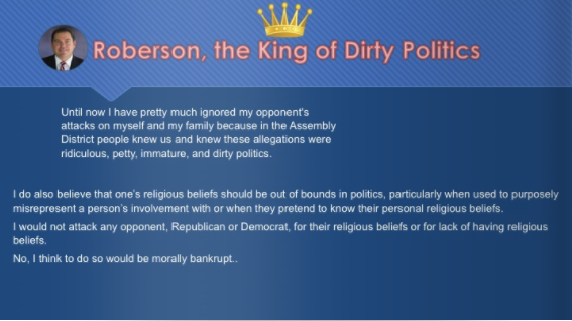 All organized religion has internal rules and politics. Their membership have the right and can be expected to promote their religious values in their own politics. We tend to frown upon the organizations themselves being directly involved in politics because they can use that power to increase their own power and eventually become the power. This is where Islam and most other religions are different. Islam doesn’t have politics - by it’s own nature it is politics. Sharia law doesn’t end with their membership - it seeks to create a global caliphate. Every religion would like every person in the world to reach their version of enlightenment but they don’t all demand it. Now here is a list of Scientology KSW policies that essentially defines Scientology as a fundamentalist belief system. So there is no room for softening or revising the original doctrine to be more civil or to accommodate conventional sensibilities. The main “stated” goal of Scientology is to Clear the Planet (for everyone to get rid of their reactive mind). Think about what that means. In order to be Clear every person would need to be subjected to extensive Scientology auditing and training - probably at great personal expense since Scientology believes that letting someone be “out-exchange” facilitates their degradation and out-ethics. If Scientology says you are an SP - Suppressive Person they can deny you the services to become Clear or strip you of your Clear certification and all services. You become their version of a second class citizen. I’ve always wondered about this. Does that mean you get your reactive mind back by decree or you are now a Cleared SP? So to be Clear means you are also totally subject to their ethics and judicial procedure. One of the first things Hubbard did when he got people alone on the ships was to implement the RPF - Rehabilitation Project Force, their internal degrading slave labor gulag. When I was in the Sea Org it was completely common for anyone from a new recruit to a veteran co-workers you knew well and respected to disappear from post only to reappear on the RPF in a dark blue boiler suit, unable to speak unless spoken to, living in the basement, eating the crew’s leftovers. At Flag Landbase in Clearwater they lived in the parking structure. 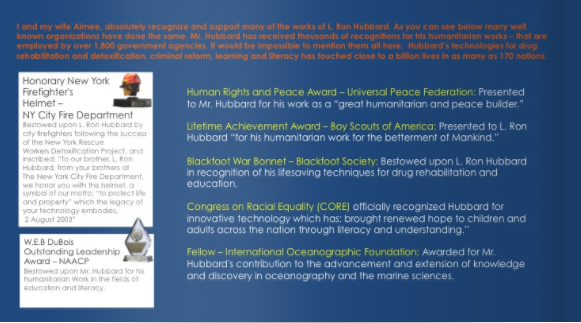 I have absolutely no doubt that this was what Hubbard had envisioned for a world governed by Scientology just like I have no doubt that Muhammad envisioned a world where Muslims ruled over all and everyone else was subjugated, enslaved or dead. So when a candidate with Scientology affiliations demands that their religion be off limits to scrutiny try to get them to define the limits of Scientology’s political ambitions and the limits of KSW. They can’t honestly do it. They must equivocate. 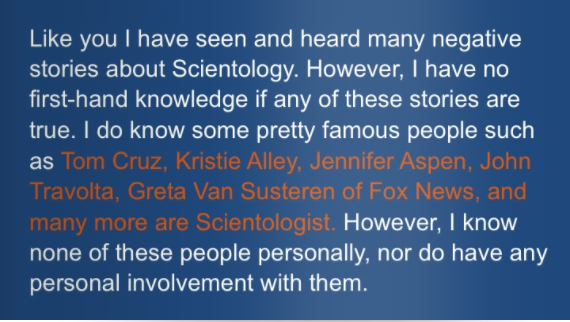 To publicly deny you are a Scientologist is a suppressive act. To say you do not want Scientology and it’s study tech to be used in every school is a suppressive act. To say you do not want psychiatry and psychology to be replaced with Scientology is a suppressive act. Every business and government should use Scientology management tech. Not applying KSW is a suppressive act. In this kind of world not expressing your devotion to KSW strong enough is a red flag just like not clapping hard and long enough for a dictator can get you placed on a list. 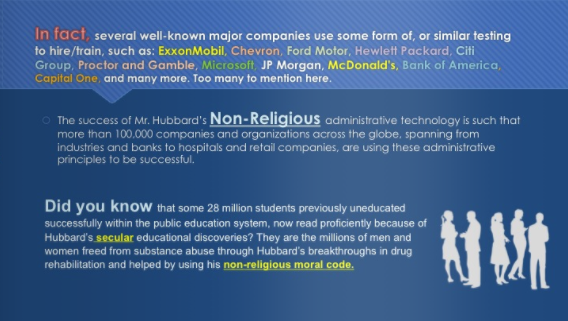 He was only saying he was using secular aspects of Hubbard's writings in his business. A Republican candidate for lieutenant governor included Scientology-themed videos and language in training material for employees of his Las Vegas bottled water company and forced a top executive to attend treatment centers sponsored by the controversial church that allegedly tried to “brainwash” him. But Jones and the parent company of Real Water, Affinitylifestyles.com, have been targeted in several discrimination lawsuits by former employees, including one centered on claims that the former lawmaker required her and other new employees to watch videos with Scientology undertones that promoted the controversial system of religious beliefs founded by writer L. Ron Hubbard. Although a District Court judge ruled in Jones’ favor and ordered the cases to be remanded to arbitration in late 2017, court documents including depositions of Jones, his son and wife and a former top employee paint a picture of a workplace that appears to blur the lines between promotion of Scientology as a religion and various secular management techniques created by Hubbard and taught by groups close to the church. 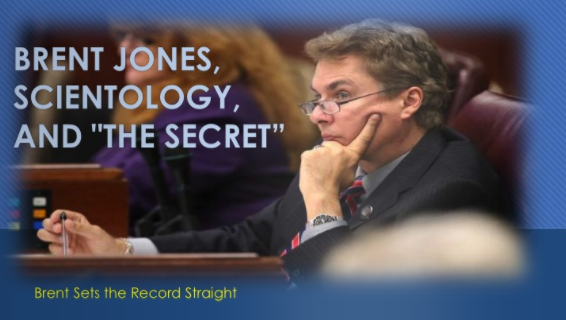 Although Jones dismissed many of the allegations in the lawsuit during an interview with the Las Vegas Review-Journal in March, court documents indicate that he has closely integrated many aspects of Scientology into his Las Vegas business, which employs between 40 to 60 people at any given time. "Jones also introduced President Donald Trump at a January 2016 rally in Las Vegas and was one of the earliest of elected Nevada Republicans to endorse the future president." Anyone who would elect to public office someone with ties to the toxic $cientology cult deseves what they get. Brent Jones came in a distant 2nd place in the Republican Primary race for Nevada Lieutenant Governor but beating out four other Republican contenders with a significant lead. Almost 25 thousand people voted for him knowingly or unknowingly regardless of any alleged Scientology affiliation. I think this tells us that there is still more work to be done in terms of Scientology awareness and that his conservative populist platform has a fairly strong voter appeal. As I've stated, I think the COS adopts political agendas based on self interest as opposed to altruistic motives or the general principles generally thought to be behind those agendas even though they might seem worthy of support and seem to align with other groups or political parties. I also believe that the COS risks losing more followers by adopting conservative sounding agendas than liberal sounding agendas because entry level Scientologists tend to be fundamentally utopianists by nature and must be indoctrinated into the set of Scientology agendas that are generally interpreted as being conservative or populist. But even though Brent lost this race I think the COS will interpret these numbers as a conservative populist platform being a successful action for Scientologists seeking public office. Brent can maybe front for the $cientology/Miscavige Casino & Resort in Vegas? Good to have friends in govt. to take care of you and make payoffs to legislators and regulators, amirite? A Lt. Gov. has got to be a good guy to know for money laundering contacts too.